As you know, our winter was long. We even had snow into May. This delayed my favorite flower in their blooms. The Peony!!!! i fell in love love with these pom pom blooms in a Martha Stewart magazine when we lived in California. My month ear in law swayed me not to spend my money on them there. She had tried to grow them and all the Midwest “freeze” tricks that we used on lilacs wouldn’t work. When we moved to Kansas, I bought multiple plants. Dotted around the yard, they look completely dead in winter, but then the woody shoots climb out of the mulch. Large broad leaves show hints of a small nub of color. The peony usually is in full bloom by Mother’s Day. This year, they bloomed over Memorial Day. The last week I have been picking the blooms and spreading them around the house. The rains this week made it imperative to share the love. All the neighbors got beautiful bouquets. Even Scout is getting in the fun (not so). He loves the sweet smell and is getting to the blossoms faster than I can get them picked. AAARGH!!! Not sure what this dog doesn’t eat yet. I think Scout likes the flowers and eats them because he is a winter baby and never had those smells in the yard. 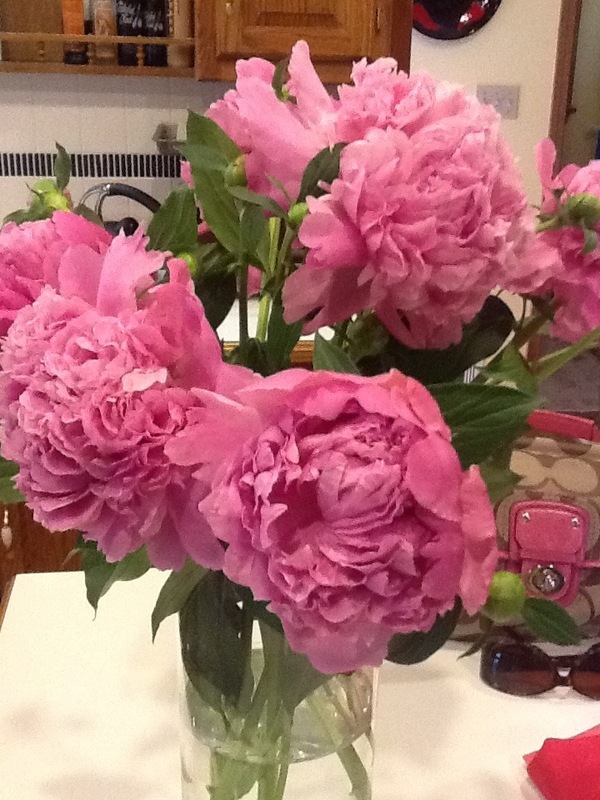 This entry was posted in play outside and tagged peonies, pink, Spring by julia. Bookmark the permalink. Congratulations! Those are gorgeous blooms. Peonies are difficult to grow, impossible in temperate California. They prefer a freezing winter and less alkaline soil. People either love or hate peonies. I’m jealous. Scout eats them because he’s a dog and likes to try everything at least once. You need to be careful at night, when you’re asleep. I love mine. I used to get the lilacs to bloom in Almaden by throwing a bucket of ice or 2 on the tree base a couple times a winter. Once I figured that out, the lilac tree bloomed every spring ! ! !